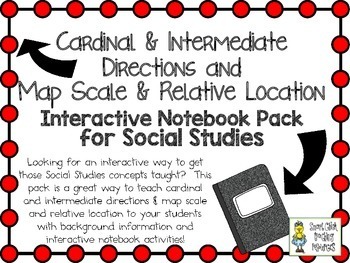 This pack contains three interactive notebook activities, for cardinal & intermediate directions as well as map scale & relative location. There are pages of background information, multiple interactive notebook activities, a page for a project idea and an assessment. 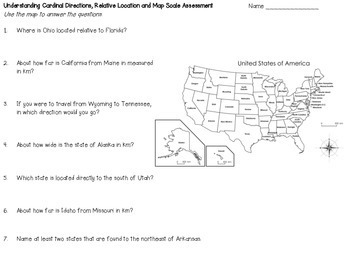 Cardinal and intermediate directions as well as map scale and relative location are usually taught in 4th grade and then used in later grades. 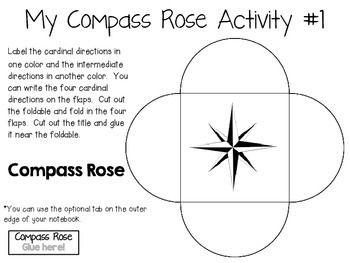 These pages are meant to be used as a resource throughout the year. We place them in our interactive notebooks early in the year and then refer back to them regularly. There are a few interactive elements in this pack. There are directions on each one that should be easy to follow. The labels and tabs are optional, but I have found that they make organizing the notebooks a whole lot easier! I complete these activities over the course of two class periods. 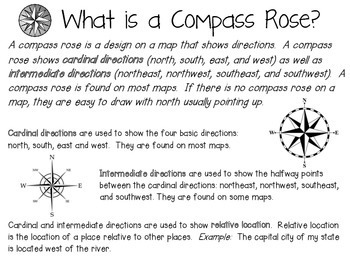 We refer back to the pages as we do other mapping activities throughout the rest of the year. We use spiral notebooks for our Interactive Notebooks for Social Studies. I shrink the pages down slightly (93%) when I copy them so they fit easily on the page. There is usually a page or two of informational notes to be glued directly into the notebook as a guide for students to remember the skill as well as more interactive pages so students can practice the skill. We refer back to the information in our interactive notebooks as we are studying different topics in social studies.